PSSST... Speakeasy tours special offer... Dare I do this? Note: This offer expired today, January 1 2013. Reposting, for those of you who have asked about dates and fees. This offer is limited, and will remain available until January 1, 2013. This will be fun! The following Speakeasy tours are definitely a "go", since there are enough signups to make them work. As an added benefit, I have included a new option, available to anyone who chooses from this date forward, to bring one, or up to 2 friends along for just $25 each. This is a limited time offer during the holiday season (depends on response). Why? The more, the merrier... within reason, of course! And because there are people who want to come along (or bring someone else), who have expressed that they are a little cash-strapped at the moment, and boy, can I relate! Yes, you still get lunch - even at $25. Here's the kicker... When you spend $100 via Paypal, you may qualify for the Bill Me Later program, which lets you delay your payment for 6 months, with no interest. Click through for details. This makes it well worth it to bring a friend along. Already signed up and wanna bring someone along? After you have paid your own Speakeasy tour fee, you may sign up a friend, or have the friend sign her/himself up, mentioning in the comments who the full price participant is. Offer expired. Thanks to those who took advantage! The cost of this guided, efficient tour is $75 per person. If you use this trip to shop and participate in what NYC has to offer, you will save at least as much as you are paying, and probably far more. Wanna come? Click below the date you wish to attend, send payment, and the details on meeting time/place will be provided. Today, I led some fabulous ladies around the garment district, on a shopping trip I specifically altered to suit to their interests, and boy, did we have fun! Want me to tell you all about it? Nope. This one's "classified". You've gotta come on one for yourself to experience the magic. So, I guided them to the things they were seeking, and helped them to find great feathers, lace and lace trim, great sculpted leather flowers, and breathable, high quality knits. Efficiently. With lots of laughs in-between. Oh and a bonus NY political figure sighting and photo op! Want me to show you photos? Let's say you know and/or love someone who loves to sew or craft. There are some gifts guaranteed not to disappoint. Time is short, life is busy. Did you know there are some fabric stores, sewing studios, and websites who offer gift certificates and other gift possibilities? Well, here are some ideas for you. Or, you can always treat yourself or anyone else to a "Speakeasy" shopping trip! The next one is scheduled for this Friday! If you know of any other NYC garment-related stores offering gift certificates, don't hesitate to chime in! 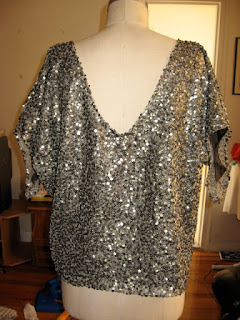 Sequins, however, do have one absolutely stellar advantage: they make anything ordinary look festive. They make you feel like a million bucks. 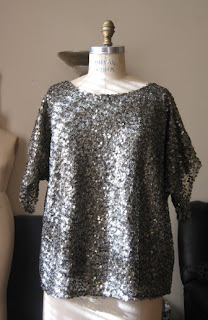 Here are some alternative thoughts on how to use sequins for your holiday finery. The following project was for a client of mine. 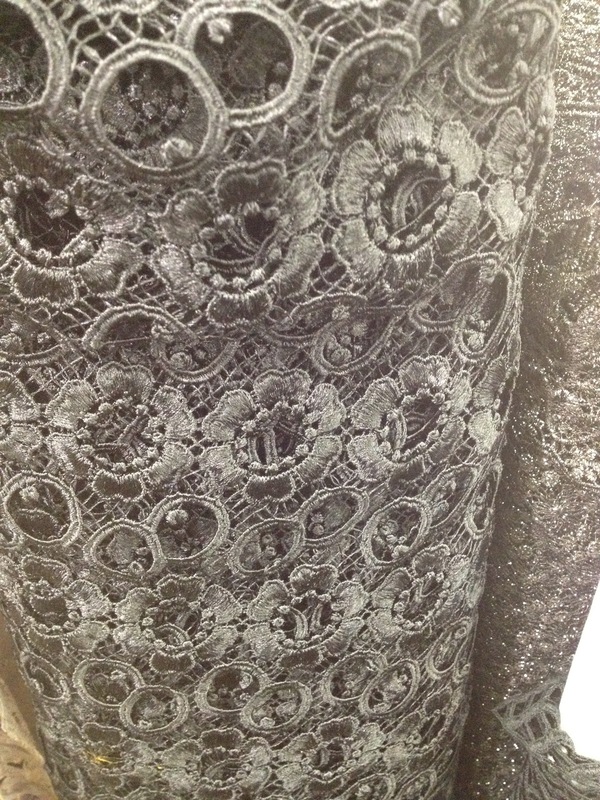 These are fabulous metallic sequins attached to a mesh from B&J Fabrics. This fabric is wonderful, but the application of those sequins looks so random, how do I navigate the seams efficiently with a sewing machine? Minimal seams make it easier. Why not show a little skin in the back, huh? Okay, so you can also add sequin trim to a garment, or you can get hot-fix sequins you can iron on, which I imagine, can be problematic, so experiment a bit before committing to this. 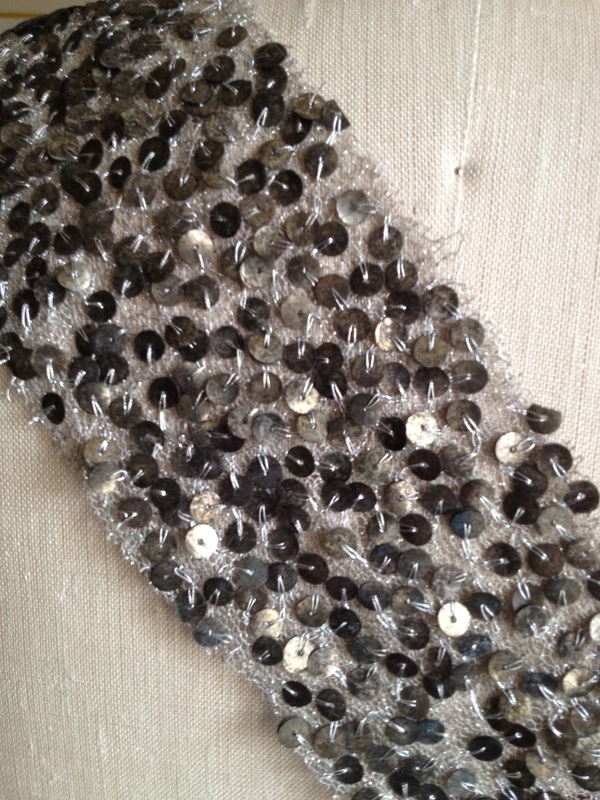 For the truly committed, you can sew on your own sequins individually, but you'd also be amazed at how beautiful a delicately interspersed sequin embellishment with a Swarovski crystal center can be on even the very simplest silk tank! Add them to your shoes, you bag, your hair accessory, your hat... whatever! 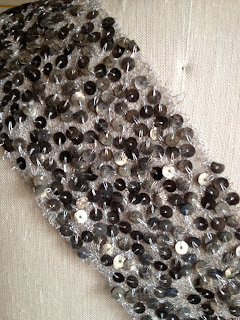 So where you can you find fun sequins? So, it actually isn't too late to get started. Don't be afraid to add a little sparkle to your holidays this year! I must say, yesterday was a perfect day. Just perfect. That doesn't happen often. Had a great morning meeting, followed up with great time with my kids after school, and then a PARTY. Yes, a PARTY! I don't get out much at night people. I'm a mom of two kids. This was a big deal for me. We actually played fabric and designer trivia games!!!! And while I never win anything, and I mean ANYTHING... ever... this time, since it was trivia, not luck, I knew the answers to many of the questions, and, as a result, I totally racked up on fabulous fabric swag! Yup, there were prizes! Peter of Male Pattern Boldness - and Yes, he was wearing the great color blocked shirt! And I also got a chance to have great conversations with other passionate people who are in the industry, but not the blogosphere! You know what proves how much I enjoyed myself? I didn't pull out my camera EVEN once! It all began with a morning visit to Kashi. 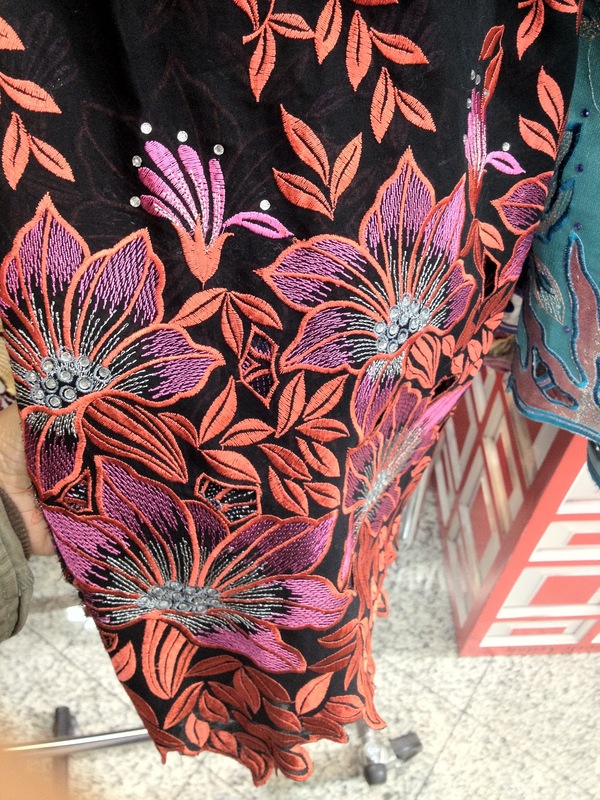 Yes, that Kashi... of Metro Textiles. I guided a garment district "Speakeasy" tour back in September, and vowed that no fabric shopping money would leave my pocket that day. I was not there as a shopper, but a guide, I kept telling myself. 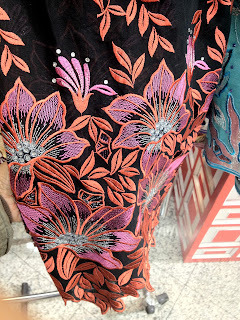 I had to be an effective one, too, curbing my raging fabric lust long enough to effectively show, assist, explain, and discover along with the participants I was leading through the offerings of the amazing stores we visited that day. After all, I'm an adult. A grownup, in fact. Yes, with a solid and manageable quality stash, limited "free" time, and... and... I just have to be practical. I tried to focus in on my job. Really tried. 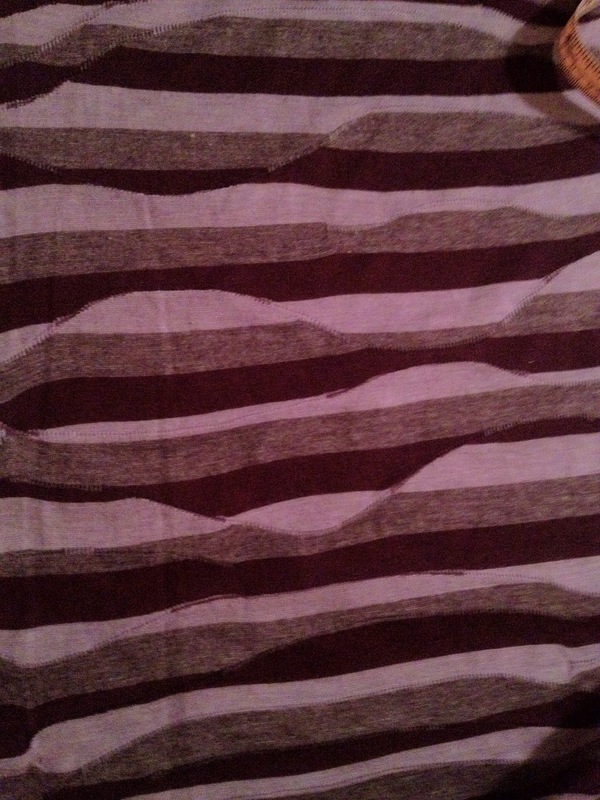 But...This fabric winked at me from the corner. It did. A cotton stretch knit - waves of deep eggplant purple, a sedate varsity purple, and a mellow frosted baby purple (like equivalent of baby blue, but purple, ya know)? 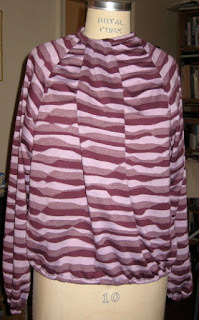 Very soft, kinda stretchy (one way), sheer-ish in the right light, and wonderfully drapey. Fiber content tested at home with burn/smell/melt test. I didn't buy it, although I did gently brush it flirtatiously a few times as I walked past. It was available in two colorways. Both of them exciting. But one of them (pictured above) was just swirling with possibilities. It kept whispering to me. I felt a bit dizzy. Maybe even a bit weak. 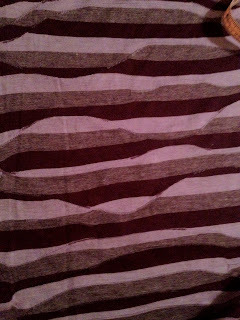 I tried to think about other things, help people find what they were looking for, and even tried to help them find what they didn't know they were looking for, consult on how this or that fabric would look as a dress, a top, a pair of pants... But... It kept calling my name. I was blushing. My palms were sweating. I fanned myself. What had come over me? I tried to shake it off, and forget all about it, as we went on to other stores, saw piles and stacks and bolts and piles and PILES of other options, but the memory of that encounter just wouldn't leave me. Unable to forget the magic of that moment, I ventured back to Metro a few days later to sweep up some of that delightful yardage, hugged it tightly, and brought it back to my workspace. What would it be? I knew it needed to be a shirt. It had told me so. A deliberately eccentric one, with raglan sleeves. Maybe a pocket? Comfortable and cozy for winter. I wanted an asymmetrical twist or turn somehow at the neckline, and... well, maybe a pocket. "Let's keep it roomy," I thought. Aiming for something similar to view B (the blue one), I drastically changed/recreated the pattern to accommodate my body, a stretch knit, and my other fit and style preferences. My daughter, age 11, called this pattern "boring". 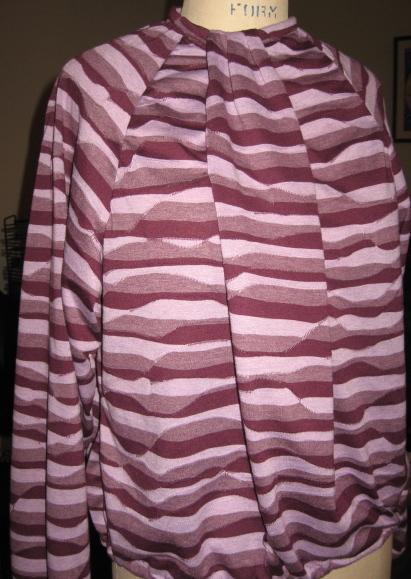 During the redesign process, the shirt, on its way to "becoming", passed through a few weird phases. I'll call them (1) Tween Pajama Top, (2) Post-Menopausal -hide and seek (still at least 15 years or so away, I think), and finally, (3) Dr. Seuss meets "Where's Waldo". Those impractical peekaboo slits changed form, ultimately disappearing entirely, and the shape of the shirt oh-so gradually morphed as I worked the silhouette and design idea from what was once a sort of vague, blurry vision, to the happy, totally "me" shirt it is now. Yes, I inserted an invisible center back short zipper in a stretch knit (after stabilizing), so I could create a close neckline that wouldn't stretch out. I gently elasticized the sleeve hems and hem of shirt, to get a gentle "blousing" to happen. No stripe matching. Deliberately. Makes the fabric dance. The tucked fabric "cascade" from the neckline to hem has no seams. And then I put it on, for about the 10th time (and even that might be an exaggeration - as in TOO FEW times) at the end of the design process, looked in the mirror, and involuntarily whispered aloud, "I love you it." True story. And I mean that. 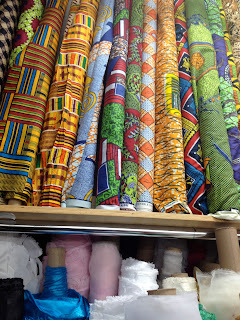 NYC Fabric store review: Elliott Berman... Outrageously great store. Over the past few years, before I took over this blog, Elliott Berman Textiles had been mentioned a few times, in a few different posts. And, for some reason, I felt as if I had been there before, and maybe didn't think too much about it, since I'm not particularly swayed by designer names, or "exclusivity" for exclusivity's sake? Heard the name before, I'm sure... didn't place it too high on my priority list. Colleagues with decades' worth of experience had heard of them too. But had they ever been? "I think maybe once...wait, I'm not sure... I know the name. What street is that place?" No particularly ringing endorsements. No gasps or sighs, nothing. Whatever. But, I'm here to tell you... Whoa. Now that I've reported back to them just what I've found... they have ALL put this place on their priority lists. Inspired to go after talking to the lovely Australian who sang their praises at length, this place started to intrigue me, and, to top it off, an extremely warm written welcome from Eugenia made it a must-see. And man, oh man... where do I even start with this place? For starters, it is upstairs. In an office building. On 35th Street. You won't pass this place by accident. 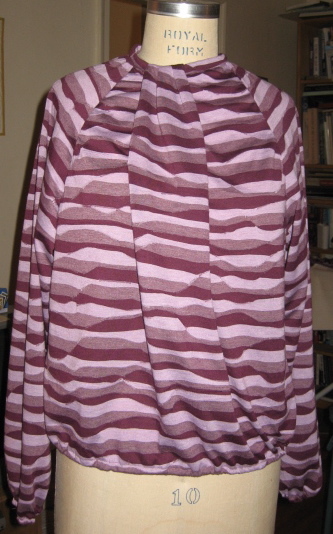 I started my research by visiting their website, and I fell in love with this fabric. Wanting it desperately, I knew I wanted to just visit and touch it, before making a final decision. I gave myself a little mumbly-pep talk in the elevator on my way up, promising myself not to shop, just explore and think a bit, since my unstarted projects pile is getting to be a bit ridiculous. So, I stepped off the elevator, and headed down the hall a bit to the showroom. And when you do go, (and I'm thinking you will...) you will find a showroom set up for wholesale, not retail, which can be intimidating. But the key here, is... Eugenia. Lovely, engaging Eugenia is welcoming, engaging, and gives you all the information you need to just dive in to the beautiful selection this store has to offer. They also have a great website, listed as a favorite by some of you who responded to the survey! So, why here, instead of the gazillion other fabric stores? Quality. Oh, and BEAUTY. Crazy, like heart-palpitation style beauty. Eugenia holding a fabulous silk header card. Now, on their website, they share that many of these fabrics are remaining goods from design houses like Chanel, Milly, Dior, Missoni, etc. This isn't the stuff someone found laying in a corner of those design houses. Nope. Not the rejects, either... 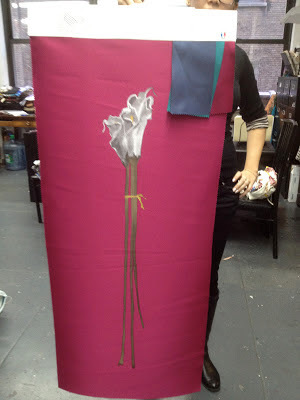 The ACTUAL fabric the designers used. Just touch it. It speaks to you. And wait... the goods they are selling that come from these design houses isn't from past collections... not from past collections... from the NEXT collection, and some from custom projects done for private clients, and no one else. Yes. That current, and that exclusive. Many of the fabrics were custom done for the design houses, and some are "signature prints" (meaning the designer's logo or print is repeated in the print of the fabric itself) and lots more beyond those. Oh, and the knits! The resilience! The hand! The artistic value of the prints and colors! So gorgeous! What would scare me at this point, if I were you, is talking about price. Believe it or not, this place has prices you can do, with some fabrics near $20 or so a yard, and on up, depending on how fancy you wanna get. Most things I loved were somewhere in the $30-40 range retail. So go. And tell them I sent you. And, if you order online, they are ready, willing, and able to serve the international customer! And, for you designers and fanatics out there attending the DG Expo, be sure to visit their station, and tell them hello! What, you haven't heard of the DG Expo? Stay tuned for the next post! The art of making lace in one form or another has existed from the earliest ages. 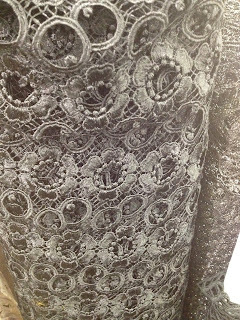 There are scriptural references to various web-like fabrics, which were made of rude construction, no doubt, but whose general characteristics were identical with those productions of modern skill which have for centuries been known as lace. Homer and other ancient writers constantly mention net-works of fancifully embroidered materials; gold thread-work was nown to thee Romans, and as Egyptian robes of state are depicted upon the tombs of the earlier dynasties as being fashioned from a looped net-work or crochet..."
So, here's my question for the day... if all spiders know how to spin webs (and let's assume all do), why don't they consolidate their efforts, and some work on spinning webs, while others gather the prey? Why don't they work together? Pictured above, is a fabric combo on its way to becoming something unique for me, inspired by a dream I had, an unrealized idea from a client I had last year, and the "Spiders Alive!" exhibit at the American Museum of Natural History. A spider uses its own body measurements to make its web, using a very practical and ergonomic design process. The spider starts with the most difficult part of construction -- the first thread, and creates an extraordinary silken net, often as beautiful as it is functional. It is also abolutely unique and personal. We work to create our own intricate handmade patterns, using yarn, strings or thread and fabric, and our own human hands. There is something very natural about this. Something very real and tactile... Individuality is important. Personal expression, the need to share beauty, and this sense of accomplishment are vital. There is something so unique and special about a spider's own ergonomic study that leads him/her to design and create their own custom web; it speaks so beautifully to our unique desire to create beautifully customized garments and furnishings for ourselves. It explodes from our souls in even the most dismal of environments and circumstances. It is a necessary communication, and, as much as we need to create, the things we create NEED to be created. I say this to reinforce the following point: There is only ONE you. If you are creative, honor that fact with what you create. Listen to your body; the way it wants to feel, be embraced by wonderful colors, textures, and variety. If you want to celebrate that in the ones you love, make things for them, too. The fabric stores are listening to us! 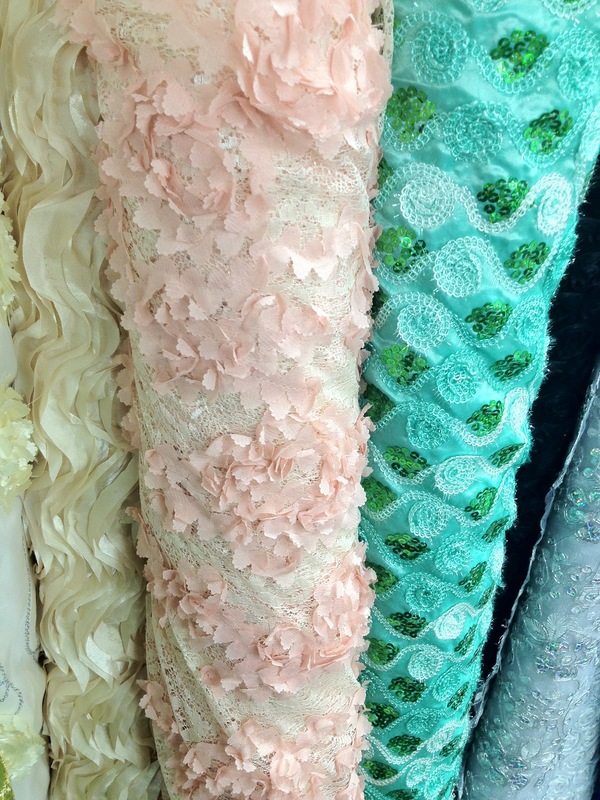 I have gotten great feedback from some garment district vendors regarding the recents posts on fabric shopping online, and the concerns and frustrations expressed by so many of you. Because they really want to improve and serve you better, they are very interested in hearing your answers to the questions on this brief survey. Please click through here to participate! I wrote this post years ago, and maintain that it is still as relevant today. I have since changed the buttons (last year) on this coat to a far more interesting, bold, and stylish choice, and routinely receive great unsolicited compliments while strolling through the city. Feels great. And cozy. And like ME. No one else. All told, this exact coat probably cost is about $350 in materials to make, and, what I would estimate was $800 in labor or so. And that was in 2009. So, no, not a coat I would choose to/could afford if it were even available for purchase. Feeling like Kathleen Turner's character at the beginning of "Romancing the Stone", I just completed such a big, long-awaited, satisfying project, that, if I were a drinker, I would pour a glass of celebratory champagne. 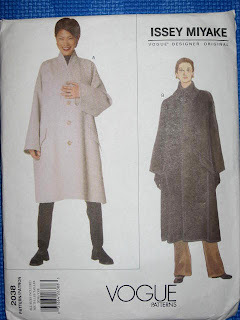 I never meant to be sewing this coat during the winter weather, but it isn't my fault. Seriously. I am actually right on time, and it is winter that has come early. 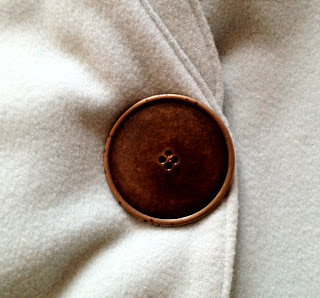 In this mid-October "coldwave", I am now peacefully transferring my long-awaited coat from the sewing table to the closet. I promised myself that I would not post this until everything about this coat was complete, and now, with buttons on, hem done, final pressing finished, and stray threads clipped... it is ready to wear. 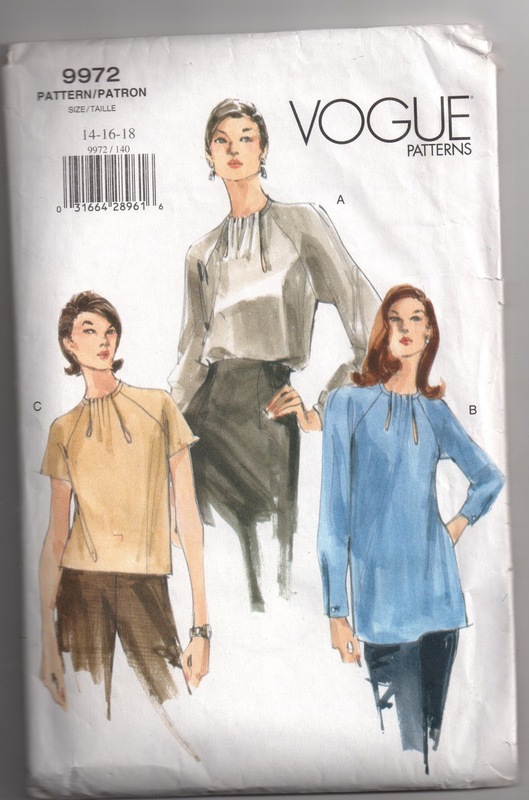 Completion date (10/16/09) Vogue Pattern 2038, issued in 1997, which marks exactly how long I have owned it. Eventual HUGE (2 1/2" diameter) buttons I chose after writing the related posts. 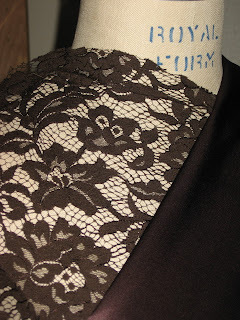 Closure is false (no buttonholes) - closes instead with heavy snaps inside. I put this plan into action several (make that many...) weeks ago. Okay, so I can't throw it on to go to the supermarket or to run my daughter to dance class, although the shape and fit are casual. Why not? Because, worn with sweatpants or similar garb, this coat can easily go in the "Bag Lady" direction, despite the quality of the expensive (but totally worth it!) fabric used to make it. This coat took me 3 months to complete. Not because it was so time consuming, but that's how much time it took me to find the free moments where I had enough energy, attention and passion to sew it. I made use of every little inch of creative personal time I could squeeze, and now I'm glad I started in the hottest blast of summer. What I love about it most, though, is that during this process, I must have put this coat on at least 20 times, and now, with it completed, it really feels like a coat! I have full confidence that this coat will be as warm as any store-bought coat I own, and the weight of the fabric is just right for me. If you want to read the rest, start here, and click "newer post" at the end of the first post. And then, if you come back to this page again, click here for another. That's a lot of back and forth, huh? Maybe I'll pull some old posts over, with current commentary. Oh, and I forgot to comment on why the title of this post is "Why Fine Fabrics are Worth It" Did I mention that this coat looks like BRAND SPANKIN' NEW every time i put it on? That it hangs like a dream? That it feels like the coziest, most luxurious blanket you could ever imagine? That the color is outta this world magical? So... that's it. Rewind!!!! Re-introducing myself and the blog! Sometimes, when I venture out into the blogosphere, I happen upon such interesting stuff, voices, points of view... people. At times, I am very interested in the people behind the blogs, but just don't have the patience and time to go through post after post, trying to understand who they are, and where they are coming from. For that reason, every once in a while, I think it is important to take a step back to reintroduce myself and the purpose of this blog. This blog, once owned and authored by Meg, who has since moved on to work at Mood, is now authored by me, a passionate garment district enthusiast, and fanatical professional maker of things for private clients, television, film and theatrical productions, and occasionally... for myself and loved ones. A curated tour of stores you probably otherwise wouldn't know to visit. A group of fellow sewing enthusiasts as excited as you are. A dedicated stretch of hours to completely indulge in shopping. Discount opportunities you otherwise wouldn't know how to obtain. Additional info/guidance/expertise/inspiration to help you decide, articulate, and get what you need. Makes a great gift for the fabric-lover in your life! I have been shopping in the garment district since I was 12 years old (a mere three decades ago)... seriously... on my own... really! And I used to buy some of my notions at Woolworth on 34th Street! That actually used to be a reasonable choice for notions, and I still have tools with price tags on them to prove it! But all is not lost, as there are some pretty fantastic stores out there. Now. And I'm finding them... one by one.. and noticing when they improve, too! Because of the "speakeasy" nature of the district, due in part to the skyrocketing cost of real estate, many of the places you would love are hidden from your view. So I continue to tell you about them here. Or... if you come on one of my tours, I lead you to them in person, help you find what is fabulous, swing you some special discounts, help by giving you company with creative energy to share, and even advice and encouragement when needed. If you are looking for something in particular, tell me. Comment. I'd love to hear it, and tell you what I know about how and where to find it! The tours I lead are shopping tours, not sightseeing tours. There is no transportation via private vehicles or admission fees to anywhere involved. Any distance beyond 10 blocks would be navigated by subway, and I would be paying your fare, so no individual Metrocard is needed. From outta town? If you need hotel and/or travel help, I will advise some of the BEST NYC secrets I know! Also, you can click on hotels above (this page - to your right) for the most standard and convenient choices. Payment is only accepted via PayPal (you do not need a Paypal account), credit or debit card. No cash, personal checks, or additional payments will be accepted on the day of the tour. The trip will involve a good amount of walking, so come prepared, and healthy. Note: If you book at least two tour people for a tour, you can choose the "Bill me later" option on PayPal, and pay no interest for 6 months. "My special “shout out” and thanks would go to Eugenia at Elliot Berman, who is one of the nicest people in the whole garment district, George and Michael at Mood, for whom nothing is too hard, who have a great fabrics knowledge and who are genuinely interested in the customer’s interests, and to Michael, Lucy and Marceau at Paron…I remember Michael from Paron the first time I went into the store back in about 2000. All at Paron are always so nice and so helpful." 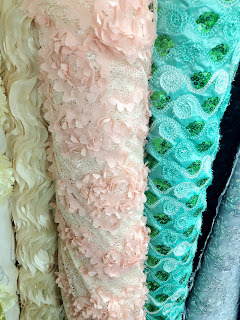 The comments on my last post have inspired a lot of digging into why the fabric stores find maintaining websites and online order fulfillment so cumbersome, and the information I've gathered is both enlightening, and sobering. 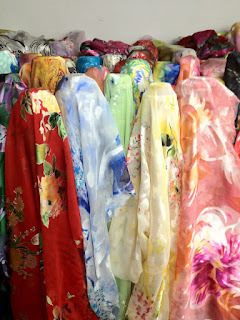 "The shipping issue is not whether the ship fee costs more or less than the fabric being purchased. The issue is whether you are being asked to pay a reasonable ship price having regard to the available options. I tried to buy from a large online retailer that has a strong presence in the garment district (already referred to in a different context in these comments) and was asked to pay $230 for delivery of a package using UPS when the same package would have cost around $30 using USPS --- I know as I looked the cost up, emailed back and asked if it was a possibility to have the package sent USPS and there was a total lack of interest. It was pretty off-putting…and I cancelled the order. A $300 cancelled order was no biggie for them I suppose, but the larger issue is whether the right business model is in place for online retailing. The domestic US market is so big that perhaps it is not of much interest to cultivate an international market…but I think it is truly the way of the future…and for goodness sake, wouldn’t every NYC garment fabric store that pays shocking rents and frets about their business future in the declining district want to think about additional revenue streams? Even though Australia is a small country (population wise) we punch above our weight. Australians are fanatical online shoppers. One international clothing retailer lands 2 cargo planes of packages in Sydney EVERY DAY…EVERY DAY!! Australians were fast on the uptake with online shopping, and continue to be fast on every new internet, mobile thingy that comes along, so it’s the perfect market destination. (And for the time being too, there are no import taxes for packages under $1,000)." In my own life, I began my professional career in banking, managing letters of credit and bills for collection for an enormous Japanese company. I learned a great deal about the complexities of international shipping, documentation, and the financial end of things. I moved from that position into export documentation for a three different textile companies, and from there, went into fashion jobs. Since the companies I worked for had customers all over the world, we often had to send samples, swatches, and small amounts of yardage for testing, sample making, color approvals, etc. In those days (the 90's), many NY fabric companies used regular commercial services, like DHL, UPS, TNT and others, marking the package as "sample", and stuffing them into document envelopes or soft-sided envelopes, paying only the document rate, exploiting a shipping loophole. This is no longer possible, as the couriers will now only allow documents to be shipped in document packages, and there is a maximum weight for documents. That explains why I remember it being so cheap affordable. Nowadays, the most doable and cost-effective option, as mentioned by Liz, above, is the US Postal Service. The only less expensive method of delivery is if you happen to be a soldier on a US military base abroad. Now, I'm not suggesting that any of you start hanging out at bars, revealing bare shoulders, winking at people in uniform, but hey... to score a great piece of silk.... no, no, no... I'm just kidding! The best thing, by FAR to do, is to come here on vacation, or even on your way elsewhere, since NY is a crossroad to so many other destinations... do your shopping in person, and bring an extra bag, suitcase, or ship it back to yourself at the post office. If you want to be really efficient about it, come along on one of my shopping tours! Depending on your location, as far as shipping is concerned, the price for getting your package shipped from New York can really be outrageous, due to documentation requirements, the cost of transport, taxes, duties and fees. Many countries simply have governmental layers preventing the economical transport of goods to individuals. This is just a fact of life. Some carriers offer outrageously preferential rates to select businesses, due to the volume of shipping they do. A company that sells in significant volume at the wholesale and retail levels could be in a position to negotiate with a large shipping company for great rates. When it comes to websites, running a website requires CONSTANT updating, and keeping track of inventory of the goods offered on the site is a huge task. And if the site is popular, and business is booming, it really requires EVEN MORE upkeep and personal customer service. More than many people are willing or able to maintain. It is no small affair. At all. I'd like to offer a list of websites of reader-recommended garment district web merchants who do a great job selling online. In your experience, which ones do you like? When a simple trip turns into an adventure! 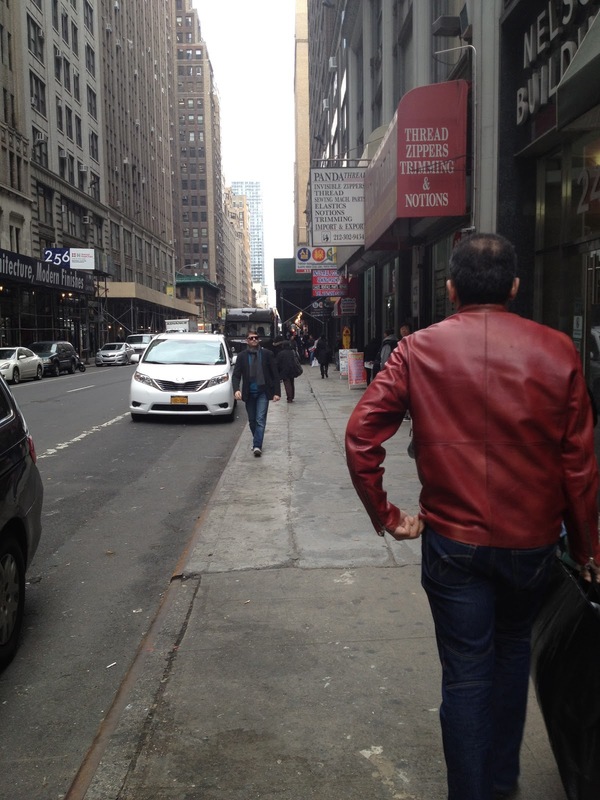 An Australian reader of this blog came to New York during the last week of October, and was extremely enthusiastic about shopping in the garment district. No stranger to New York City, she already had her favorite stores in mind, as well as her usual haunts, and very sweetly offered me the opportunity to meet with her for a bite to eat, share her insights as an international customer, and... well, get some additional shopping tips, too! With the looming hurricane threat (no biggie, right? ), and my own busy schedule, I wasn't able to make concrete immediate plans with her, but we were able to correspond via email, with a tentative plan to meet up on October 29th. No worries... we could always bring umbrellas, right? I gave her some "must sees" to add to her schedule, and she explored those stores happily, with plans to continue her Manhattan fabric shopping spree after the weekend. "A couple of guys at Fabrics & Fabrics yesterday will attest to you that yesterday when I was in the store I could be heard saying several times over “Oh no! What has that women done to me! !” --- meaning you, of course. Wow, what a store. I spent hours there...looking, talking to (the proprietor), looking, buying... a lot... To add to the excitement, they were having a sale, with 40% off silks (squeal) and 35% off woollens (all other fabrics discounted as well). I got silks yesterday and took swatches for woollens on the basis that I would think over the weekend, work out what could go in a suitcase and what I might need to post, get postal rates, then go back on Monday to do my wool purchasing." You've noticed the timing here, didn't you? Her original plan was to fly back to Australia on Tuesday the 30th. I thought maybe I could hop into Manhattan and meet with her post-Sandy. Nope. No subway. No driving. No gas. We had planned via email to talk to each other on the phone. But after the storm roared through, even that wasn't possible. "Sorry we didn’t manage to catch up with each other and I’m especially mortified as I have just seen your latest post on STGD and, I too was wandering around the garment district on Friday and we could have caught up with each other. There were big problems with the communications systems at the hotel last week. Their phones were down for a couple of days and internet too, so while the phone lines were up again on Friday, I didn’t see emails again until Saturday…and then that was all in a rush as I was packing, checking out etc. The phones were a real problem as I (along with most of the hotel) needed to call airlines and do all other things necessary to accommodate a delayed schedule." What we did do, however, was have a really LOVELY, long VOIP phone conversation after she returned to Australia, during which, she gave me amazing bits of information regarding her post Hurricane Sandy experience as an accidental long-term tourist here in New York City. While this part of the story and her impressions of the experience could fill pages on their own, I'll stick to the fabric information for this post. Because she knows first-hand just how hard/impossible it is for her to find all of the wonderful things she found here in a heartbeat were she in Australia, and she seriously LONGS for better access, I feel I NEED to share this information with you. Some of you, although you may not comment publicly here, are store owners, fabric vendors, and other fashion professionals. Some of you are international shoppers and American shoppers who simply aren't close enough to shop here in person! Vendors, I know that opportunities abound for you among the enthusiastic international buyers, and if you can reach, serve, AND satisfy them, it will be a mutually beneficial relationship! For this post, I strongly encourage comments and dialogue. Shoppers, let your voices be heard... and vendors, let the shoppers know how to find you! High quality photographs whet the appetite for fabric, just as beautiful food photography does. If you can accurately convey its softness, drape, fuzziness, stretch, or sheen in a photo, the viewer can "feel" it, and will be more likely to buy. Shipping fees, carriers and charges are of GREAT importance to international shoppers, and if the vendor is only willing to do what requires the least thought, without doing at least a small bit of research/fee comparison for the client, that client will not make the purchase. It is important to understand that shipping fees exceeding or coming at all close to the price of the goods purchased, make a customer feel disrespected and unimportant, and makes the vendor look like he/she is not on the customer's side. If it hasn't arrived by __________, please let us know. At that point, we will ____________ OR ___________. Fancy terms and words that make the client wonder will lose the sale for you. It is great to give a fabric a fun name, but care instructions and real-life words, like cotton, silk, or wool, are more easily understood. Some stores in the garment district sell online, and those that my client has used have big challenges in at least one of the above-mentioned areas. Keeping in mind that selling internationally opens up the world as potential competitors, it is an area where you really have to bring your "A" game if you want to compete. But here's the thing; the quality and variety the stores offer right here, gives many of them an automatic advantage, as she was just floored by the options available to us right here! The international (and long-distance shopper) is real. And special. And, perhaps... an untapped market??? And a boost to business and the economy of the garment district and New York City. They should all get one, great, big virtual HUG! So... I'm on crutches for a bit, and should be back among the walking very shortly. Rest, Ice, Elevation, Compression, and meds. Doing that now. 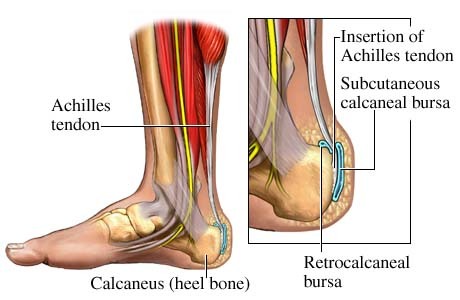 While this is a pain in the neck for me, I am acutely aware that there are people dealing with far more sever issues in their lives than mine. After Hurricane Sandy, loss of homes, loss of lives of heat, or electricity, an early blizzard, and numerous inconveniences, I am glad that I only have this inconvenience to slow things down for a little while. I go back to the dr. today. Doing much better than I was! Healing is going very quickly, and I should be back in action very soon! Due to the powerful "Sandy", the need to support the Garment District vendors, and my own eternal optimism and enthusiasm, I have added two additional Speakeasy tour dates for this year, and one additional for next year. Note: Tomorrow, November 8th, at 10AM, I will be guiding a personal tour for a November 2nd signup, who will be travelling back to her home state soon. If anyone wants to come along, let me know tonight, okay? These dates represent the alternative choices for those who had originally planned to come this Friday (which isn't looking possible for many of you), and some new choices for anyone new who would like to come! The day's schedule is the same for every tour, but the combination of stores we visit will differ. Spent a bit of time in Prime Fabrics last week, and found that my take on this store is pretty different from the earlier review on this blog. Wandered in during my post-Sandy stroll, and just in case they have improved their collection and layout since the post was written, I figured I'd check them out, and what I experienced there was pretty darn cool. Or, could it just be that I appreciate the theatrical and highly festive nature of their offerings??? I wouldn't really go looking for standards in there, and I don't know what I'd tell you to go in looking for specifically. As for me, I'd go for the fun stuff. There is a heavy emphasis on fabrics that appear to be from Africa, Asia, India, and many other places I'm not too familiar with... Let me add, no one in that store shopping seemed to be looking for standards or "normal" fabrics, and I do kinda thrive on that vibe... Creatively speaking, I found it inspiring. Will we get back to... "normal"? So, on Friday, the scheduled date of our Speakeasy Shop the Garment District Tour, I went into Manhattan, to wander the garment district... I have had power at home throughout this ordeal, and the subway takes me right to the garment district from my starting point... incredibly slowly... but it will still get me there. A trip that would normally take 45 minutes took 2 really long hours on Friday. Note: This experience is NOT at all a challenge, compared to what so many New Yorkers are going through. I wouldn't want to minimize their experience AT ALL by whining about a fabric shopping trip. Trust me, I am keeping it all in perspective. I was looking for an escape. And I didn't find it. Many stores were open, and some were closed. The ones who were open, looked completely ready to do business, but the streets were pretty empty, and there were no walk-in customers to be had, it seemed. The mood was somber, and the feeling of approaching winter was in the air. Looking down 7th Avenue, there were police guiding traffic past 23rd Street, after which there was no electricity. It was awfully quiet, and there was very, very little street (vehicles) traffic. I wanted to write a journalistic post about my experience yesterday, but the trip kinda left me in a low mood. I couldn't find an "angle" to make it hopeful, uplifting, or anything. It seemed that we were all kinda down, and, frankly, traumatized by the whole experience. People who were at work, standing in front of their buildings talking to each other or on cell phones, seemed to be having the same conversation. "I'm here, but what am I supposed to do?" Everything, it seemed, had come to a standstill. One of my friend's offices (at an EXTREMELY high-end luxury company) "generously" offered the employees the option of bringing their children (for whom school is closed until Monday) to work. Another friend, with a child in private school, was happy that her child's school was still open, but, with no gas available for the car, and having to choose between school and work, she couldn't take her. But today... power has come back to many places in NYC, and the mood seems to be lifting a bit! I'm seeing celebratory Facebook postings, and some garment district stores have happily posted that power was restored, so maybe my little excursion was just one day too early! And, remember, there are alternative dates for any of you who missed November 2, or simply wish to come along in the future! You can find the choices here. I haven't heard from many of my November 2 tour participants, but if any of you want to shop tomorrow, I do know that at the very least, these stores are open and fully operational! Just wanted you to be aware of the possibilities!